iHome iP3 review | What Hi-Fi? This is the second iPod speaker system we've seen from iHome, a US subsidiary of SDI Technologies, that's making big waves in its homeland. 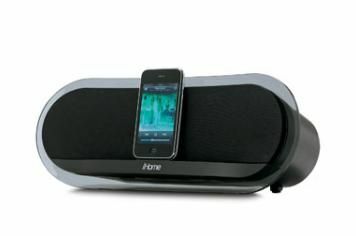 Billing its iPod clock radio (not this model) as the “No.1 selling iPod speaker system in North America” and claiming to be the “No.1 brand in the iPod electronics market”, iHome is certainly bullish about its standing. That said, we were far convinced by the iH19 and – look away now if you don't want to know the result – we're even less so with this, the iP3. Asking for the same money as our existing Award-winner in this class, the Logitech S715i, means it has to back up its price with build, features and performance, and in these regards it's something of a let-down. Out of the box there's nothing much wrong with the way the iP3 looks, but for £150 we want more than that. You can tell it's not as solidly built as some of the others on test here just by looking at it, and it proves as much as you start to get to grips with it. Our sample didn't sit flush on the desktop, and had a slight wobble with every push of a button or when pushing an iPod into the dock – which is far from ideal. On the features count the iHome scores well, however, being equipped with a video output (component) as well as an auxiliary line input. You're treated to a remote control, too, which gives you control of the iPod functions, volume and also the ‘Bongiovi' (yes, that's right, he's the second cousin of rock megastar Jon Bon Jovi) sonic tuning. Sadly, the ‘B' button isn't going to save this one as either way the iP3 delivers a thin, lightweight sound that lacks clarity. Poor sounding, and with question marks over the build, we find it hard to find too many saving graces with this iHome effort.